The last two times I was in Cleveland for their bridge tournament (yes, I can't believe I decided to go for a third time in five years), Dr. Marc and I went to Lola for our nice meal. 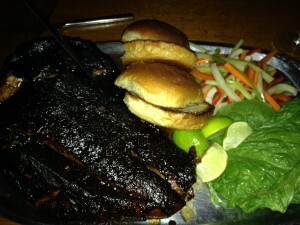 This time, we decided to try somewhere different and made a reservation at Greenhouse Tavern. Chef-owner Jonathan sawyer has been getting lots of critical acclaim, including a James Beard nomination for Best Chef in the Great Lakes region in 2014. It is hard to resist when I see “Pig Head” on a menu. Dr. Marc and I were joined by our friends Doug and Jon, after our tournament ended on Sunday. The restaurant was half full. A strange space, filled with shelves of VHS tapes and hanging bicycles. They do not have cable, so instead of being able to keep one eye on the Patriots-Colts game, I had old Cheers episodes in the background. It was so dark in the restaurant, only one of my pictures turned out. Dr. Marc and I decided to start with the crispy chicken wings confit. There were 1 million yelp reviews raving about how delicious these wings were. A generous portion arrived and the meat was fall-off-the-bone tender, but the whole dish was stunningly acidic - far too much for me. I commented on it and Dr. Marc felt the same way. We told our server and he ended up taking it off the bill. In fact, Jon’s tobassco fried chicken appetizer was far superior. After our appetizers, we proceeded to wait over an hour for the entrées. Doug and Jon both ordered the famous lamb burger, Marc and I opted for the beef burger instead, on the principle that we couldn't have 3 of the same dish on the table. We unanimously agreed that the burgers were delicious. The fries were massively over salted. One of the dishes that greenhouse Tavern is famous for is the roasted pig's head. It is served on a half sheet tray; the pig head is present in all it's glory. When I took the skull bones out, the teeth were still there and I could see where the pig needed dental work. There were a couple bites of the pork that were unbelievably good, however the skin was flabby and there was an enormous amount of fat. I skipped using the brioche buns and opted to eat it straight or in a lettuce cup. It was not worth the $48 price tag. Someone at the table commented that it was not the best head they have had. We had another long wait for dessert; I couldn't resist trying the buttered popcorn pot de creme. It was a delicious smooth custard that did taste like buttered popcorn. The meal was expensive, service was abysmal and I really regretted not returning to Lola for third time.